This beautifully soft bobble hat is handmade by Katie at her studio in Wales, each hat is made on a hand-powered domestic knitting machine. Inspiration for this design comes from cultural architecture and traditional Japanese textile prints, combined with indigo dying processes and patterns. 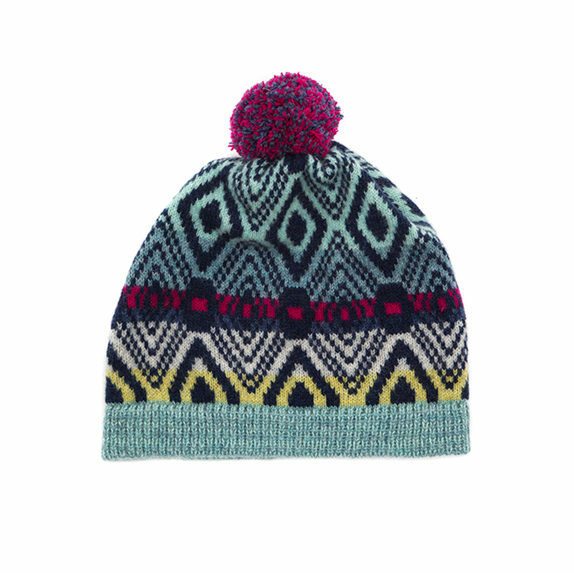 Made from the highest quality merino lambswool yarns, this unisex hat is perfect to keep you warm this Winter. Topped with a handmade pom pom 7cm in diameter.This completely unique design will give you warmth and style, perfect for a treat to yourself or as a gift to someone special. Knitted and hand finished with love and care.